See the barrels in person! 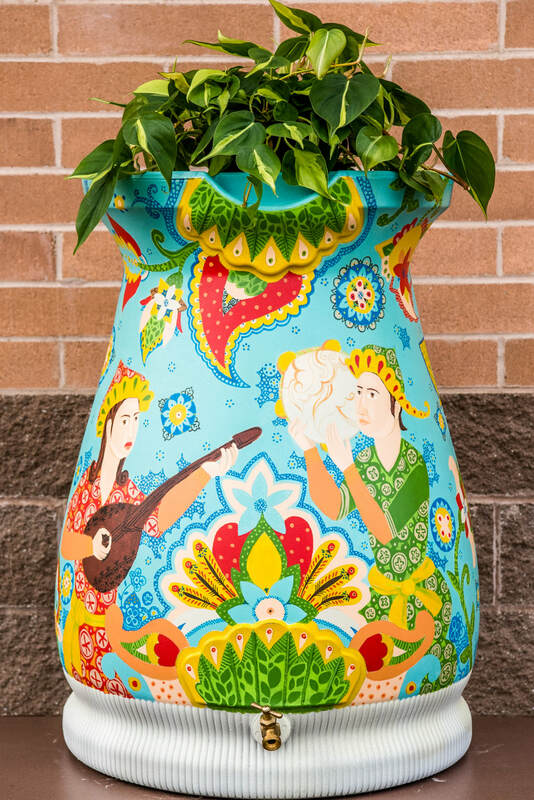 The barrels will be displayed along Main Street in the Arts and Design District in Carmel from August 10-17th. Vote for your favorite in the People's Choice Competition - "Like" your favorite on the Rain on Main Facebook before noon on August 17th. Buy your favorite! Join us at the Carmel Farmers Market on August 18th for a silent auction from 8am-11am. Learn more here. Carmel High School's National Art Honor Society is comprised of a group of talented student artists who contribute to their school and to their community, through collaborative projects and outreach events. NAHS is a nationally recognized organization, connecting students professionally around the country. What was your inspiration for your barrel art? 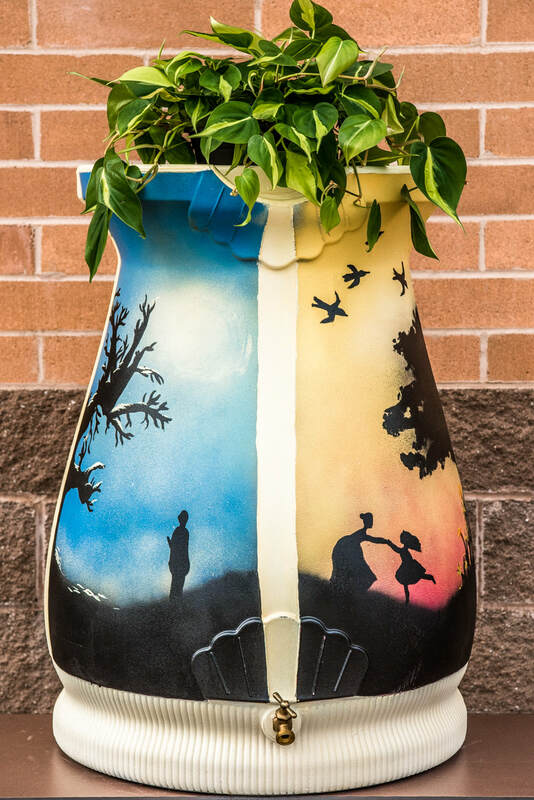 CHS junior Natalie Wells created the preliminary design for this barrel, then several National Art Honor Society students collaborated with teacher sponsor Jennifer Bubp to bring this vision to completion. 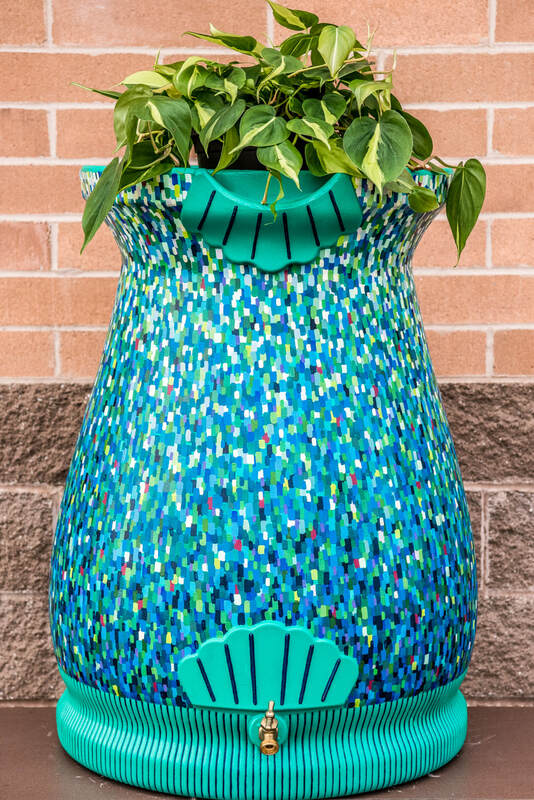 This barrel was inspired by the vibrant array of colors and plant forms visible on the ocean floor. What was your favorite part of painting your barrel? We loved spending time together while working on this barrel. We view art as a means to build relationships and bring our imaginations to life. We loved the challenge of creating a design that wraps around a three-dimensional form. We appreciated the opportunity to give back to the community and be a part of this wonderful event! I have always enjoyed creating and I paint and draw in my free time. Also, throughout high school at Guerin Catholic, I have taken numerous art classes. I am entering my senior year and my curriculum has included 2D Art, 3D Art, and Ceramics. 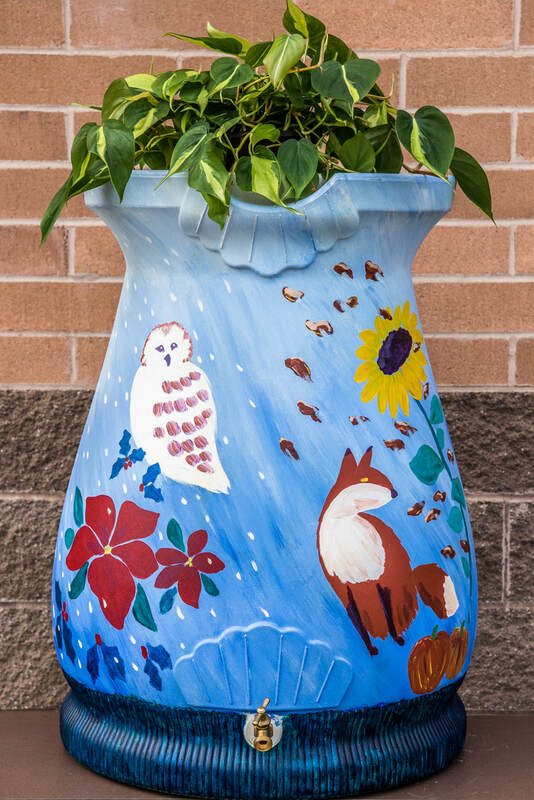 I painted this barrel as my summer project for my International Baccalaureate art course. My parents and I enjoy Jimmy Buffet's music, which often includes the idea of vacationing on islands without worry. 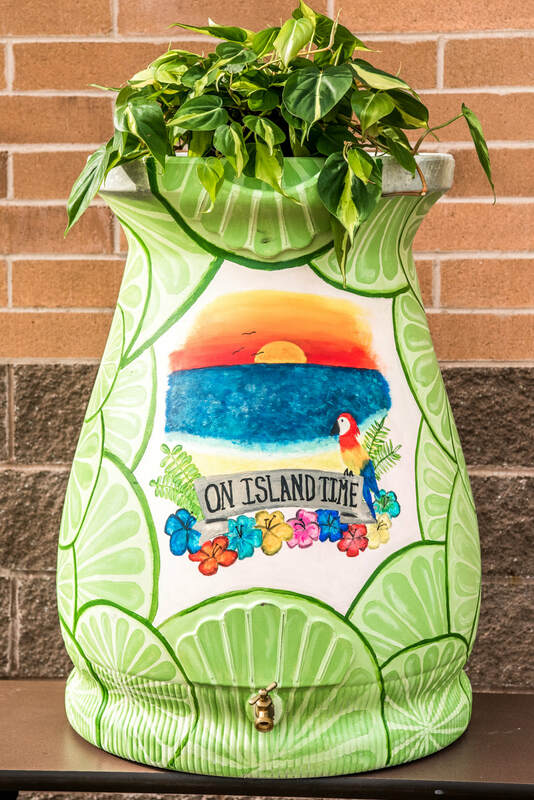 I filled the rain barrel with limes and added a "salted rim" to go with the margarita theme with which Jimmy Buffet is often associated. Even though I have never had a margarita, the music is fun and I enjoy it. In the middle I added a sunset with the words "Island Time". I enjoyed painting the limes because even though they were time consuming, they were the roadmap to the rest of my design. I also found the colors reminiscent of vacation and summer. I create art in my home studio near Noblesville, IN. I use non-traditional methods in creating one-of-a-kind originals, experimenting with many techniques in pour preparation and application, using fluid acrylics and mediums. Many of my paintings incorporate resin and are multi-layered. I am a Juried Artist Member, and serve on the board of the Hamilton County Artists' Association (HCAA). I'm also an active Artist Member of Nickel Plate Arts. I have solo/duo exhibited, as well as had individual pieces in galleries throughout central Indiana. My paintings are also part of private collections throughout the U.S. and Canada. 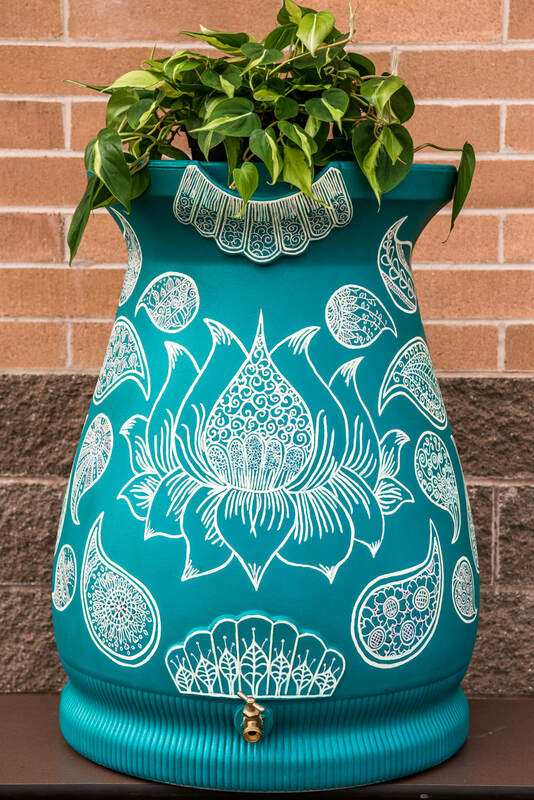 After contemplating several ideas, I decided I wanted to create a barrel that would complement the peaceful spirit of a garden. According to Greek mythology, those who ate the lotus would be overcome with peacefulness and would forget all reasons to go back to where they came from. A beautiful garden can have the same effect. I am also a fan of Mehndi, the ancient art of drawing with henna, and found this a perfect technique to go with the theme. My favorite part was doing the very detailed painting, which took many, many hours to do! I'm an abstract artist so doing intricate, detailed work like this is a complete change of pace for me. I found it meditative and relaxing, and it also further honed my artistic skills. Simply put, I have always loved art! From drawing to sculpting to visual media, I enjoy the creative process. Above all, I never take myself too seriously. I have always stood by the philosophy that there is no "right or wrong in art" - it's a way of expressing yourself and there are many ways of doing so. 'Y-cycle' stands for a few things: It combines the cycle of life, the 4 seasons of the year and what Rain on Main is all about - recycling and redirecting water (...and water means life). Y is the first initial of my name but it's also a reminder of "why" we should all recycle. As always, I enjoyed the process of thinking and creating this piece. I have loved and created artwork ever since I was old enough to hold a crayon! I graduated from the American Academy of Art in Chicago with dual degrees in graphics and fine arts. I have been fortunate to spend my entire career as an artist in various forms... as a graphic artist for many years, teaching elementary school art, and creating my own artwork. 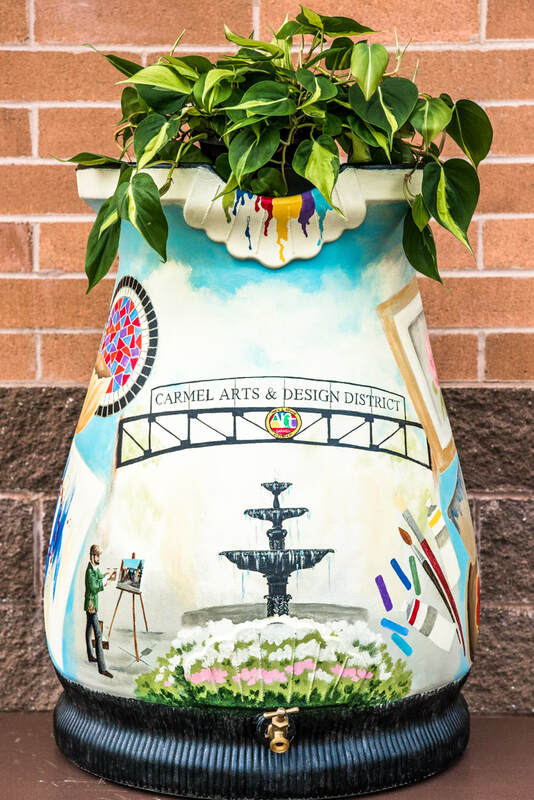 My inspiration for painting the barrel was the Carmel Arts & Design District. I have joined the CCA Gallery in Carmel, and enjoy being a part of the city's dynamic art community. I enjoyed portraying the various forms of visual art on my barrel. I'm a local Carmel artist who has shown work in area galleries and venues including the Indiana State House, the Haan Museum, ArtSplash Gallery, Nickel Plate Arts, CCA Gallery, IUPUI's Cultural Arts Gallery, and many others. I'm a huge supporter of Education and I have partnered with several Carmel schools over time creating murals that represent the school's core values or artwork that educates and informs. You can find my large-scale mural series illustrating the World of Dewey (Dewey Decimal System) in Carmel High School's library. I have a BA in studio art from the University of North Carolina at Chapel Hill and spent many years in graphic design, illustration, and advertising. This is my second year doing Rain on Main. I have always loved fairy tales and stories about the mystical fairy world which is always so closely tied to nature. 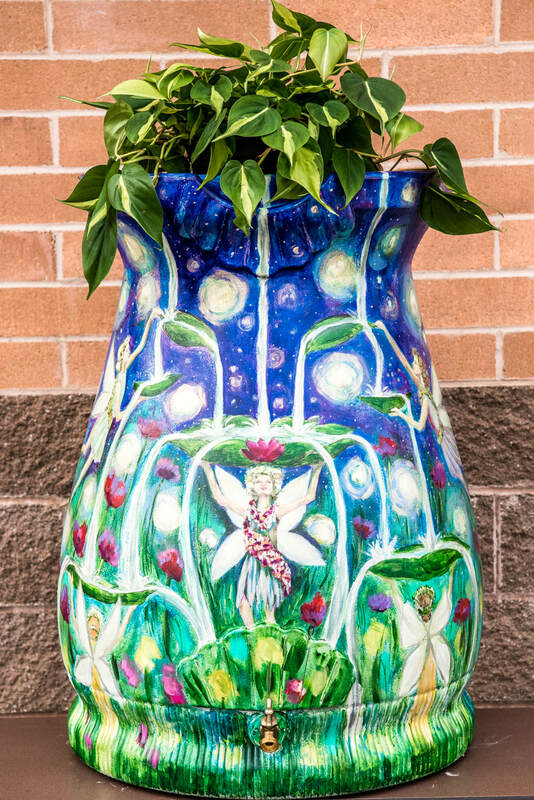 I thought it might be fun to have fairies and water sprites diverting water from the rain barrel to water their garden at twilight under a canopy of fireflies and starlight. I'm often out watering my flowers during that magical time of evening. It was fun to imagine a fairy-engineered system of cascading rivulets of water to sprinkle over their flowers and create little leaf basins for the fireflies to drink from. I loved creating the mood with the glowing fireflies, stars, and shimmering adornments. I am a graphic designer and illustrator with a significant background in graphic design. I have a broad understanding of color, composition, typography, drawing and illustration. I recived my Master of Art in graphic design from Tehran Art University and worked as an graphic design intern at Eli Lilly. These days I am working as a graphic designer at Gannett USA Today Network. In my free time, I design colorful illustrations on shoes, scarves,bags, etc. You can find my artworks at www.SpidoArt.com. I was inspired by an old Persian narrative poem composed by the Persian poet Nezami Ganjavi. It's about "Leili" and "Majnoon" who have been in love since childhood but are not allowed to unite.This is the story of true love. I decided to draw a love story on my barrel and the most favorite part of my painting was listening to music and letting the colors flow in the heart of painting. I love experiencing art in a variety of mediums. At age 50, I took a leap of faith to try painting with watercolors. I found that by taking painting lessons in both Carmel and Brownsburg, I received the instruction and encouragement I needed to press on with oils and acrylics. I hope to pass on encouragement to others who are interested. My favorite garden flowers are Lavender. And with all gardens come BUGS. This project was so fun to paint all around the barrel. Be sure to check it out on all sides, top to bottom . I am hoping others will enjoy the bigger than life flowers and whimsy of bugs found in most garden. Painted rain barrrls are a wonderful way to add beauty and watering efficiency to any garden. Anastasia Maroney is a contemporary abstract artist working predominantly in 2D. She holds a B.A. in Fine Art from Indiana University and an M.S. in Art Education from the University of Tennessee. Over the past year, Anastasia has been working to produce a cohesive and identifiable body of work by revealing emotion, relationships, and beliefs through abstract representations of color, texture, and pattern. She has taught Art in schools from Tennessee to California and Nevada, and back again to Indiana where she grew up. Now teaching at Zionsville Community High School, Anastasia also teaches private lessons from her Carmel studio. "Where There Is Water, There Is Life" is based on the fundamental idea that water is necessary for the human population to be bountiful. The oceans hold about 96.5 percent of all Earth's water. It is also present in the air, rivers and lakes, icecaps and glaciers, in the soil, and in aquifers. Most of all, it makes up approximately 60 percent of the human body. In a word, it is our life. Without access to clean, fresh water, our community would cease to thrive, and we would no longer be witness to the natural aesthetic that it provides. I have enjoyed working on this project as it progressed from the first stroke of paint to the last. Thousands of strokes have been placed with regard to size, hue, and value so that the overall aesthetic would read appropriately. Blending colors and identifying their stroke placement was very satisfying, as was finishing the entire piece with varnish to protect the aesthetic. I grew up in Brooklyn NY and was part of an artistic family. When I was young, I won a Haney Medal awarded to a ninth or tenth grade student who has shown the most growth and potential in the field of art. It was presented to me at the Metropolitan Museum of Art; that moment kick started my artistic journey. I studied Fine Arts at Indiana University, and spent most of my time at the Henry Radford Hope School of Fine Arts. In my free time I interned at both the Indiana University Art Museum's Administrative Offices and the Mathers Museum, Conservation Lab. I also worked part-time at Echo Press, a fine arts printmaking workshop in Bloomington, IN. I am currently enjoying a career in IT as a Release Train Engineer. I nurture my passion for art at home in my private studio where I create pieces inspired by my experiences as well as by nature. I love vibrant colors, for me it is the best way to communicate what I am feeling. I love to mix paints, inks and other media with a variety of techniques and tools to create unique images that invoke emotional responses from all who view my art. It brings me great happiness to see people touched by my work. This past year was a difficult one for me as I faced breast cancer. I had to focus on my health and evaluate my life and the uncertainty of my future. I am happy to say that I am a survivor, however it's not without internal and external scars. When it was all said and done, I needed to see myself with a new lens, one that felt unconditional love for the new me. The yellow daffodil symbolizes rebirth and new beginnings and the red lotus flower symbolizes love, compassion, and other emotions of the heart. In the painting the daffodil is my new normal, a rebirth so to speak of who I am now and the red lotus the compassion I now feel for myself, rediscovering who I am and loving the new me. I loved painting on such a unique canvas. It was great to incorporate the shape of the barrel into the design. It was also very cathartic to paint what I was feeling knowing it would be seen by many. I have been an artist for many years. I work in clay, paint, printing, quilting and anything that happens to strike my fancy. I have recently published my 4th children's book, THE EGG-CELLENT SUMMER ADVENTURE AND COOKBOOK. 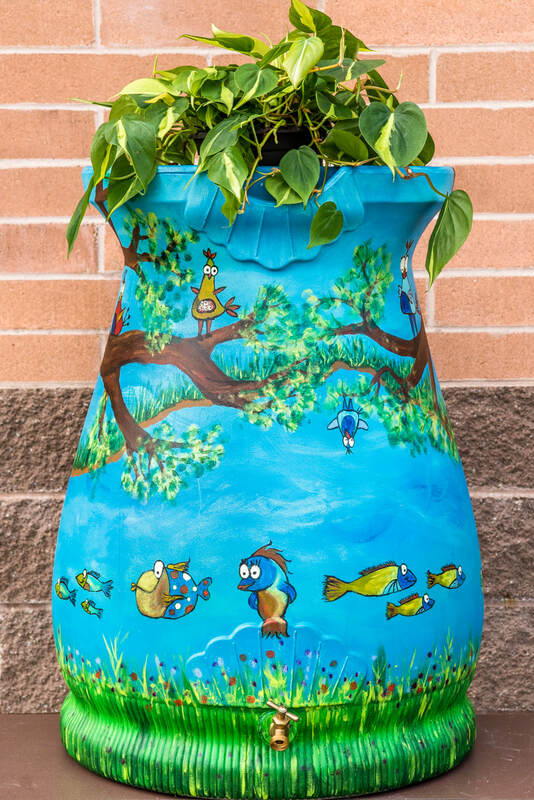 This is my third year to paint a rain barrel. I really enjoy working on different surfaces so this was right up my alley. We have a beautiful vegetable garden which I love to harvest this time of year. The creative process and seeing the transformation. I have now officially been painting professionally for about a year. I'm a business major from Purdue, but also took advantage of Art and Design classes while there, and I now study painting locally with Randall Scott Harden and Penny Roberson. I love painting sunflowers! I am drawn to their combination of beauty and strength. And they just make people feel happy! This was really fun to try something new, and on a challenging and curved and large shape. Quite a change from the traditional flat canvas! I am an upcoming freshman at IU and a graduate of Carmel High School. I took my first real art class at Carmel and developed a true passion that I will carry with me my whole life. I've competed in multiple art competition and have had my artwork on display in Japan and throughout Carmel. I work for and am sponsored by The Urban Chalkboard and was inspired by the imagination and wonder that comes with being a child. Children at The Urban Chalkboard are invited to explore and learn through nature. I used that as my inspiration for "The Dream Tree" barrel evoking childhood memories of letting go and playing. My favorite part of painting my barrel was experimenting with different techniques and taking time out of my day to relax and do what I love! My primary medium is photography but it is fun to dabble in others! I typically paint from photographs I have taken. My inspiration for this barrel was a Polaroid I took while in Florida. I enjoyed using a different color palette than I am used to, as well as a different blocky-type style. I am an artist of Russian/Lithuanian dissent living and working between Indiana and Germany now. I paint mostly in watercolor, but also experiment with acrylics and oils. I am drawn to abstract shapes that I see in realistic subjects I love to pant: from street scenes to people and ....to flowers. I love to paint poppies. I love to paint them wild and free just like they grow in the fields. They don't like to be tamed: once you cut them and try to stick them in the vase, they die. I hope I could convey it in my barrel. Throwing paint on it and see what happens! For, me my art is something that has always been there, just below the surface. It has only been in the last 2 years have I been brave enough to show my passion to others. I took a leap of faith and opened my own studio in the arts and design district in Carmel IN and haven't looked back. I am fascinated with the ocean eco-system and creatures of the deep. I wanted a play on the rain barrel and add something you would never expect to find inside. I wanted to reach different depths and illusions with the paint so for a smooth water blending I played with spray paint, then brushed acrylics over it and then layered again with spray paints for a sharper contrast. I've been personally and professionally creating work my entire life. I have an Art Education degree, art history minor, & painting concentration from Herron School of Art and Design. I teach art classes and do a lot of commission painting work. Two years ago I participated in Rain on Main and received the People's Choice award. I love a good art competition! Support your local artists! I love to challenge myself and keep things fresh and exciting. For this reason, I decided to try my hand at a new medium all together; spray paint. I spray painted the barrel to look like a peaceful summer sky and added an abstract prism of color to aesthetically give the barrel some linear lines, depth, size change, and bright colors for a visual juxtaposition. 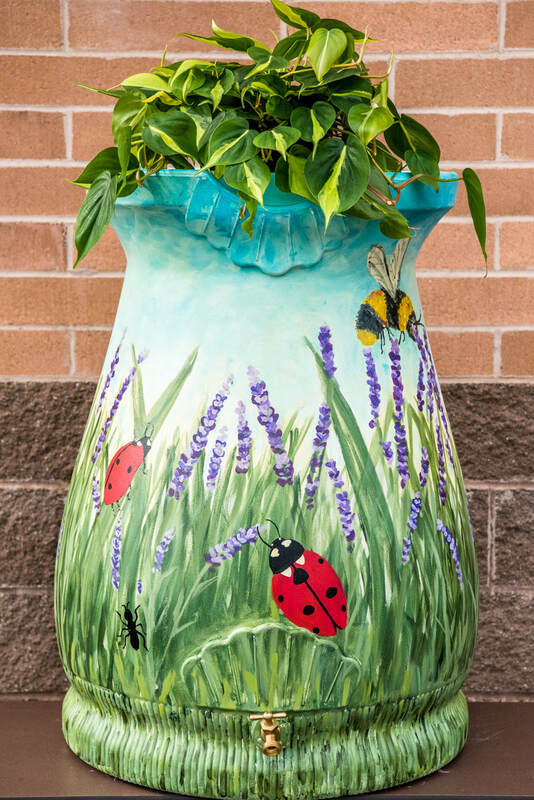 Because the spray paint was so lively, yet light I feel this rain barrel will quite naturally and peacefully be a great addition to someone's beautiful garden somewhere attracting curious butterflies and conserving our water simultaneously. Painting en plein air is always my favorite! I've been an abstract painter in the Indianapolis area for the last 4 years. "Between The Dog And The Wolf" is actually a metaphor describing the hour when day turns to night. In this piece I used the metaphor to represent the environmental 11th hour, or when, environmentally speaking, we go from being stable to being unstable. The black shapes in then foreground look a little like lungs and I believe that when the water stops breathing we are in real trouble. The process! It was a challenge. I grew up in Hamilton County in the country. I was influenced by Floyd Hopper at 4 yrs & started young as an artist. Took classes from him as an older teenager, then attended John Herron School of Art. I was a member of the Hamilton County Artists Association for 30 yrs (past president). I taught an art class at Depauw University (4 yrs). I've always been inspired by nature. Color drives me & whimsy makes me smile. All the different flowers & animals that make us think of Indiana through the seasons. Showing the movement of the breeze around the animals. I am a self-educated mixed media artist that loves to explore and learn new techniques. Twenty years ago I began to rediscover my artistic urges and I continue to find new ways to express myself through art. Although I have produced series of "serious" artistic work I delight in creating art that makes people smile and continue to make "Happy Art for Happy People". Happy memories of childhood often inspire my works. This particular piece was inspired by whimsical children's books with fun characters, much like Dr. Suess! Creating the fun fish & birds and deciding where to add them to the design!